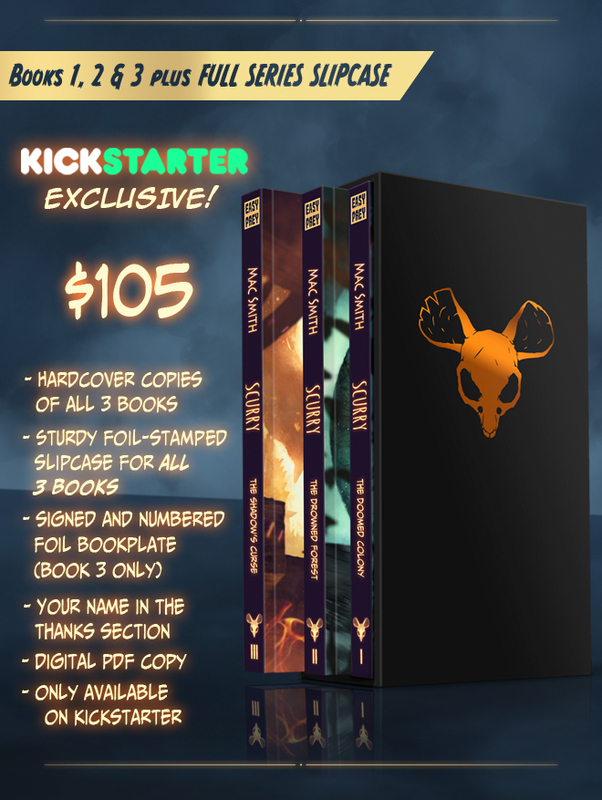 New Scurry Kickstarter Option added: SLIPCASE to fit all 3 hardcover books! I wanted to let you know that, due to a lot of interest, I added a new slipcase that can fit all three books. You can get it with the Book 3 hardcover or all three hardcover books. Some people with the premium editions were also wondering if they could also get this slipcase, and the answer is yes. Just add $10 to the premium hardcover tier and I'll add it to your order. Get your book HERE. If you want to catch up, Scurry Books 1 and 2 are available HERE. Supplies are very limited. Thanks again! Scurry Book 3: The Shadow's Curse Kickstarter is now live! Thanks for all the support and shares. Everything helps! I finally added many more characters that appear in Book 2 to the "Others" section. Check em out. Here's a map I made for the book. I'm pretty happy with how it came out. I don't know if it matches up to what you were thinking while reading, but this is generally how I planned it out. Scurry Book 1 is now available on Amazon and Kindle. I appreciate any reviews and ratings. The first book in the Scurry story, The Doomed Colony, is available on Amazon and Kindle at this link. If you haven't gotten it yet, now's your chance. If you have read the book and liked it, I would appreciate a rating or review if you have the time. Reviews and ratings help the book become more visible on Amazon. Thanks for your time! The funds for the second book have been received from Kickstarter and are safely tucked away in the bank. The final comic pages are being worked on and final edits will be done by the end of the year, if the holidays don't intrude too much. There is a chance I may add a few pages, but not too many. The back matter (character bios, artwork and other stuff) will be put together soon after, with the final book design to follow. It should be ready to print by the end of January. I will be putting together the final specs to send to the printer, and sending the deposit thereafter. Everything seems to be on schedule at the moment! 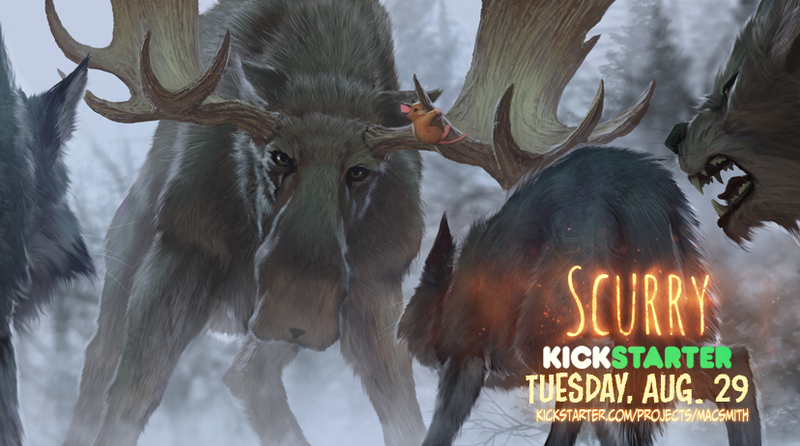 Final day of the Scurry Kickstarter! Scurry Thunderclap campaign if you want to help Scurry out (for free). Thanks for all your support! Scurry takes a lot of work, but you guys make it worth it. What is thunderclap? From the website: Thunderclap makes it so your fans don’t need to remember to post your message to their social media account at a specific time. They can sign up ahead of time, and you’ll have a clear picture of your social reach even before launch day. 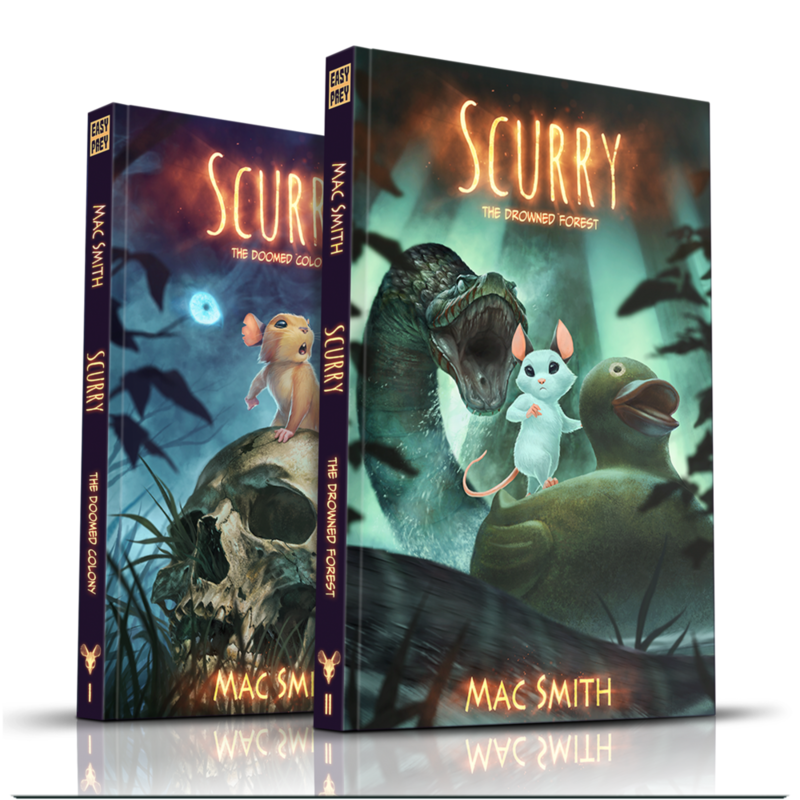 Scurry Premium Slipcase Editions are available now for a limited time via kickstarter. Kickstarter exclusive premium editions of both book one and two are available to preorder for a limited time. These are only available during the Kickstarters, so now's your chance to grab one. There are also a few sketch tier rewards left, but they won't last long. Scurry is live on Kickstarter! Paperback, hardcover and premium slipcase editions for both books are available. Original art tiers are also available but spots are very limited. SHARING THE PROJECT ON SOCIAL MEDIA IS GREATLY APPRECIATED! Scurry: The Drowned Forest Kickstarter in 2 days! Scurry Patreon has been revamped! Want to support the production of Scurry? Consider joining the Scurry Patreon. Revamp underway. I'm properly tagging posts and fixing broken links. It should be easier to navigate now. I'll be posting some new concepts and videos in the next few days. For only $2 a month, you get layered PSD files, hi-res pics, step-by-step progress GIFs and the occasional note or sketch I dig up. I'll also make available new brush sets from time to time. Exclusive videos at the $5 level, and physical gifts mailed to $10 patrons (big movie posters on the way now). Patrons at these levels also get their name added to the thanks section in the books. Adding a lot of new posts and deleting old ones. The Scurry Book 1 kickstarter has been fulfilled. Now what? The Scurry Book 1 kickstarter has been fulfilled and pre-orders delivered. Now what? Well, we'll be doing the Kickstarter for book 2, of course. I hope to get it kicked off around August 22nd. More Premium Slipcase Editions will be available as well. Sign up to the mailing list for updates. Episode 5 is well underway on the website. (Here come the wolves!) It will finish up at the end of July. I'm working on finishing episode 6 now and will start posting it in mid-August. 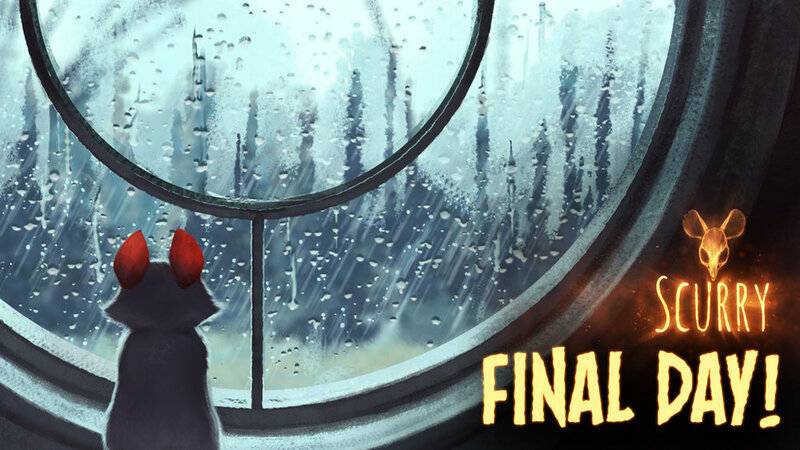 The Tapastic version of the comic recently surpassed 1 million views and 14,000 subscribers! I plan on revamping the store soon and offering plenty of new merch. Thanks so much for all your support. Sharing the project on social media really helps, too! 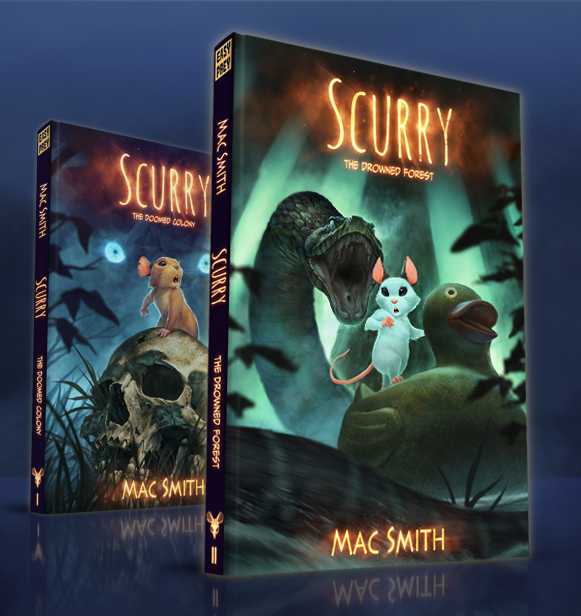 Scurry Book 1 has shipped! Hey guys, I wanted to keep you up to date on the shipping date for the first book. There will be a one month delay (to late March). Originally, the expected ship date was for some time in February, but there was a delay at the dock (due to holidays and other random problems). Once the books arrive at my distributor, they should go out within a week. I expect them to ship in late March. The books are printed and ready to go, it's just a matter of them getting here. As you can imagine, it's very frustrating! Very sorry for the wait. Advance copies have arrived. Shipping from printer soon. These should be shipping to backers by the end of the month. The Chinese New Year held things up for a week or two, but they are printed and ready to go. Once they get to my distributors in the US and Europe, they should start reaching people's hands a week later. Probably the first or second week of March. Those of you who got one of the art tiers will have to wait a few days later since they have to come to me first, but I'll have those mailed ASAP. I hope you like it as much as I do! Timelapse video of two Scurry pages.